Whether you are looking to save fuel, gain power or just look cool, C&S is here to help you find the correct parts for your project at great prices! 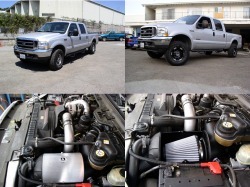 Mild to wild, we are Santa Barbara's best source of off road, performance, and appearance parts for your gas or diesel, import and domestic truck, car or off road vehicle. We also offer stock replacement parts for most makes and models. From intakes to exhausts, lifts or lowering kits, programmers and chips, tool boxes or auxiliary fuel tanks, and just about any thing else, we want to help you get exactly what you want. Give us a call or stop by our shop to find out how we can help you customize your ride. Professional installation of every thing we sell is available from our ASE certified automotive technicians. Copyright © 2008 C&S Off Road and Performance. All rights reserved.